Since January 2012, more than 860,000 tolls on the Intercounty Connector have gone unpaid, according to records obtained by WTOP. LAUREL, Md. – Since January 2012, more than 860,000 tolls on the Intercounty Connector have gone unpaid, according to records obtained by WTOP. A new law that goes into effect on Monday will crack down on drivers skipping out on tolls across Maryland and then refusing to pay the outstanding bills. It also coincides with toll increases at bridges and tunnels across Maryland. Under the old law, Maryland could impose administrative fees and turn over unpaid tolls to collections, but could not compel drivers to pay. The new law will allow the Maryland Transportation Authority to flag or suspend the registration on toll scofflaws. There are no toll booths along the Intercounty Connector. 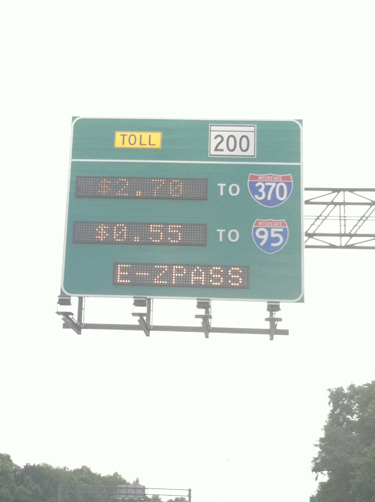 Drivers who don’t have an E-ZPass receive a bill in the mail called a video toll. Records obtained by WTOP show that 862,458 video tolls since January 2012 still remain unpaid, costing the state millions of dollars. Documents also reveal that 88,593 drivers since January 2012 have accrued two or more video tolls that remain unpaid to date. “We want to make sure everyone is paying, because law-abiding citizens are paying and they want to make sure we go after the scofflaws,” says MDTA acting Executive Secretary Bruce Gartner. Records show the 862,458 unpaid video tolls represent less than 4 percent of the overall tolls along the ICC since January 2012. Under the new law, drivers will receive a $50 civil citation if they do not pay an outstanding toll within 30 days. A driver can challenge the citation in court, but ignoring it altogether will result in his registration being flagged. That means the driver will be unable to renew the registration until the bill is paid in full. “If you continue driving through, not paying the tolls, and accrue penalties, then we can also suspend the registration,” says Gartner. That would occur only after a driver passes $1,000 in tolls due, indicating a clear and consistent disregard to pay tolls. As The Washington Post reported last year, nine rental car companies owed Maryland between $80,000 and $209,000 apiece. MDTA officials say all nine companies have since paid up, but records obtained by WTOP show dozens of drivers still owe more than $1,000 in unpaid tolls. For example, the top ICC scofflaw owes Maryland $6,454.95 in unpaid tolls since May 21, 2012. The top 10 scofflaws in total owe about $30,000, and each will have to pay up or have his registration suspended. Nine of the 10 are privately-owned vehicles. The 10th is a business vehicle. None belongs to a rental car agency. Two drivers owe Maryland $4,281.45 for tolls accrued since March 7, 2011. “We believe the press last year and the action in the Maryland General Assembly this year will mean that drivers will pay their tolls and improve the whole process,” says Gartner. But what happens if the vehicle isn’t registered in Maryland? Gartner says it’s working with tolling agencies along the East Coast to develop a system to punish drivers in other states. But he concedes that the details of reciprocity across state lines have not been worked out. “It’s our goal to work with other states to flag or suspend registrations,” he says. “I’ve been in meetings with officials in other states, and all appear motivated. But I could not give you an effective date when we’ll have something in place,” he says. Each of the top 10 ICC scofflaws are vehicles registered in Maryland. Follow @WTOPTraffic and @WTOP on Twitter.